Wa wahabna lahum min rahmatina wa ja’alna lahum lisana sidqin ‘aliya. InshaAllah, try to go into the understanding of bi sirr lam jalala, the importance of understanding lam alif. 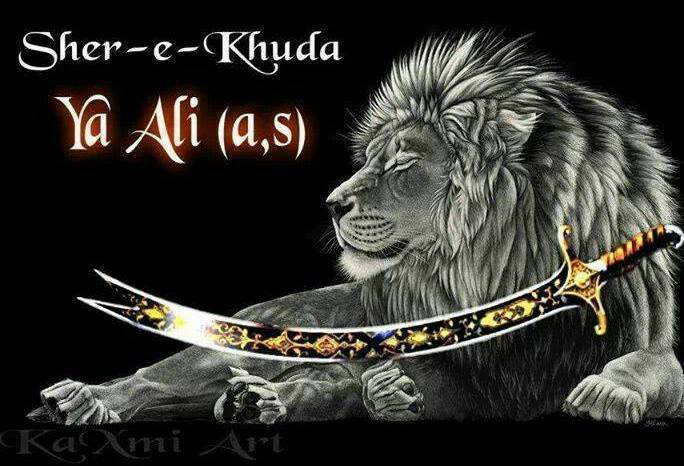 And lam alif, its reality is Zul Fiqar, is the sword of Sayyidina Muhammad (sallallahu alaihi wasallam). 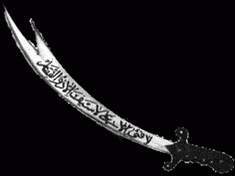 That sword of Sayyidina Muhammad (sallallahu alaihi wasallam) was given as a gift to Imam Ali (alaihis salaam). And the carrier of that sword [how’s the sound coming out? Like a feedback], the carrier of that reality means from a timeless understanding that Imam Ali (alaihis salaam)- and Sayyidina Umar, Uthman wa Ali, Imam Hassan, Imam Husayn (alaihis salaam)- is from the timeless understanding that Allah ‘Azza wa Jal has named these souls with a timeless reality. The names are from Divinely ingredients. They are not just random names and random events, but we believe that there is a time reality and a timeless reality. So in the timeless understanding, we seek those realities from our beloved guides and Ahlul-Bayt un-Nabi (sallallahu alaihi wasallam) towards that understanding. That these oceans, for us to understand, they are the realities of La ilaha illallah, Muhammadun RasoolAllah (sallallahu alaihi wasallam) لَا اِلّهَ اِلَّا اللهُ مُحَمَّدُ رَّسُولُ اللهِ. That just briefly in its understanding, that La ilaha illallah لَا اِلّهَ اِلَّا اللهُ is the alif, and by its nature it directs us that: nothing but Allah ‘Azza wa Jal is in that ocean. Muhammadun RasoolAllah (sallallahu alaihi wasallam) مُحَمَّدُ رَّسُولُ اللهِ is the reality in oceans of creation. Means that if everything must be based on the kalimah, everything must be based on the Oneness of Allah ‘Azza wa Jal. لَا اِلّهَ اِلَّا اللهُ مُحَمَّدُ رَّسُولُ اللهِ . It means then the ocean of creation, is where is it manifesting? It can’t be a third, and it cannot manifest in La ilaha illallah لَا اِلّهَ اِلَّا اللهُ because La ilaha illallah لَا اِلّهَ اِلَّا اللهُ means no, there is no god, no divinity, nothing but Allah ‘Azza wa Jal. So the nature of the kalimah, the nature of La ilaha illallah لَا اِلّهَ اِلَّا اللهُ , is that there is nothing here for you to look at from creation but Allah ‘Azza wa Jal. And has many, many deep realities. Then the ocean of creation must be existing in Muhammadun RasoolAllah مُحَمَّدُ رَّسُولُ اللهِ. We said before in the understanding of the huroof, that when you look at the lam– ‘cause this is going to show us this relationship, how this relationship is working- that the lam, lam alif, the lam, ‘cause nothing can go in front of the [alif], nothing can connect to the alif means the alif doesn’t connect to anything. Everything can connect to Allah ‘Azza wa Jal, Allah ‘Azza wa Jal doesn’t connect to anything. The alif can be there but nothing, the alif doesn’t connect to that reality. So when Allah ‘Azza wa Jal wants the creation for us to understand that: this lam, its secret is in the world of creation. So in ilm ul-huroof, the lam represents the lisaan, the tongue; that there must be a tongue, it must speak, it must manifest for creation to exist. That which manifests is called creation. If it has not manifested, it’s not from the oceans of understanding, yet not manifested, it may be in Allah’s Will. When Allah wants something to manifest, He merely begins to send the signal to the heart of the soul of Prophet (sallallahu alaihi wasallam), which is the source of Holy Qur’an. 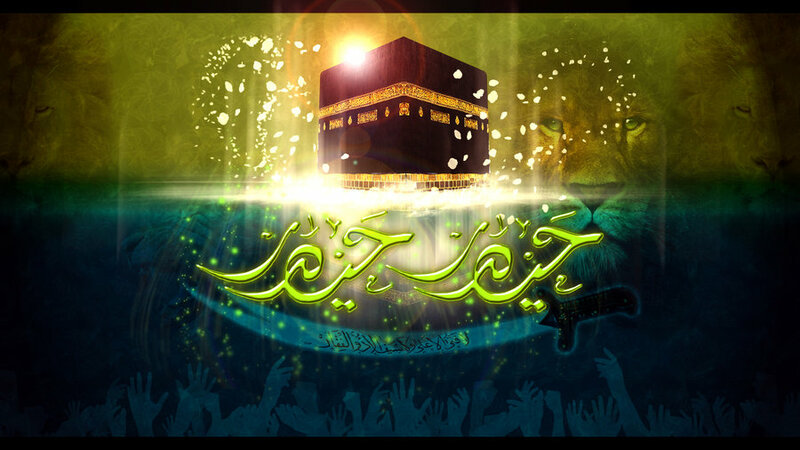 مُحَمَّدُ رَّسُولُ اللهِ , is able to hold Allah ‘Azza wa Jal’s Divinely speech. And then teaching us that: that reality, that’s why lisaan represents a creation being born. As soon as Prophet (sallallahu alaihi wasallam) speaks it from the land of the, in the world of the souls, it manifests, it’s now a creation. The two that we are concerned with is the creation of the world of subtlety, malakut [we have to try to bring these back to the Arabic so that people who want to make reference to different hadith, but we are trained in English], means the world of subtlety, the world of no form, it also is a spoken, created creation. That Prophet (sallallahu alaihi wa sallam) speaks it and that creation is in existence. 36:82 – Innama amruhu idha arada shay an, an yaqoola lahu kun fayakoon. So when this lisaan– that’s why it’s mulk, that’s why it’s creation, it’s because it’s spoken- when this lisaan and this reality connects with the alif, that begins now the understanding of these haqqa’iq and these realities. When that lisaan connects with the alif [you see that’s why we kept it in green, Are you focusing here? ‘Cause I’m saying something but they’re not seeing that]; means from the La ilaha illallah لَا اِلّهَ اِلَّا اللهُ is Muhammadun RasoolAllah مُحَمَّدُ رَّسُولُ اللهِ , they begin to explain the lam is the Muhammadun RasoolAllah مُحَمَّدُ رَّسُولُ اللهِ, the tongue of truth, lisaan al-haqq. From that tongue, everything is coming into existence, ‘izzatullah, Allah ‘Azza wa Jal’s Divinely might. ‘Wa laqad karamna bani Adam’.” That this creation of Adam that contains the light of Sayyidina Muhammad (sallallahu alaihi wasallam), Allah ‘Azza wa Jal has given a tremendous honour to it. Wa laqad karramna banee adama wa hamalnahum fil barri wal bahri wa razaqnahum minat tayyebati wa faddalnahum ‘ala katheerim mimman khalaqna tafdeela. Means then, the lam goes in front. It switches over, that, “You be My representative because creation is coming this way to understand the reality.” ‘Cause here, , you have to approach from here- you can’t approach from the end of the reality- you have to approach from the beginning. 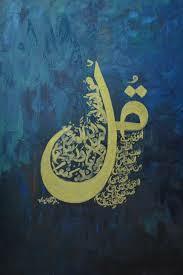 Means Allah ‘Azza wa Jal describes ma’rifah and ascension to the reality, is means: who knows himself knows his Lord. As soon as he goes within himself for his ascension, to find out what his reality is ‘cause you cannot find out what the reality of Allah ‘Azza wa Jal when you don’t know yourself, what is your name? Who doesn’t know himself, doesn’t know his Lord- that’s why the hadith works both ways. Who knows himself, knows his Lord; who doesn’t know himself, no way he can know his Lord. Allah ‘Azza wa Jal say, “You don’t know the guy you sleep and wake up with, but you want to claim that you know my Divinely presence?” Is impossible. So means the way of ma’rifa is, “I have to start from this ocean”: that understand this reality of Muhammadun RasoolAllah, then they begin to take us into what the reality of what La ilaha illa-Llah لَا اِلّهَ اِلَّا اللهُ is. It’s a perpetual reality. So when Prophet (sallallahu alaihi wasallam) say, “You say just La ilaha illa-Llah لَا اِلّهَ اِلَّا اللهُ , it gives you paradise.” This is the entry into paradise. When Allah ‘Azza wa Jal loves you and want to give you a tremendous honour, He brings you to Muhammadun RasoolAllah because He wants to grant you maqam al-Mahmood (alaihis salaam). 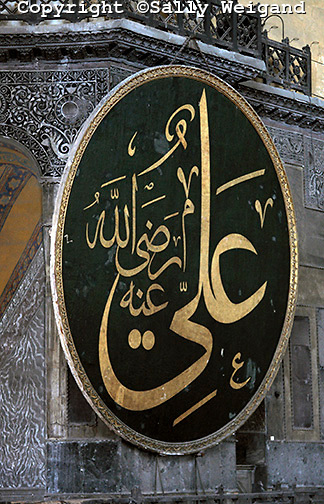 So then this baab, this gate where Prophet (sallallahu alaihi wasallam) describing, “I am the city of all these realities, and Sayyidina Ali (alaihis salaam) is the gate of all these realities.” Baab …. Means that our way to reach that reality is bi sirr lam jalala. Lam alif is Zul Fiqar. The Zul Fiqar, it’s an adaption of the lam alif. 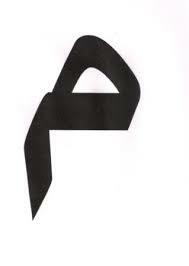 So you see the two points, and then the handle, which is the circle of the lam alif. 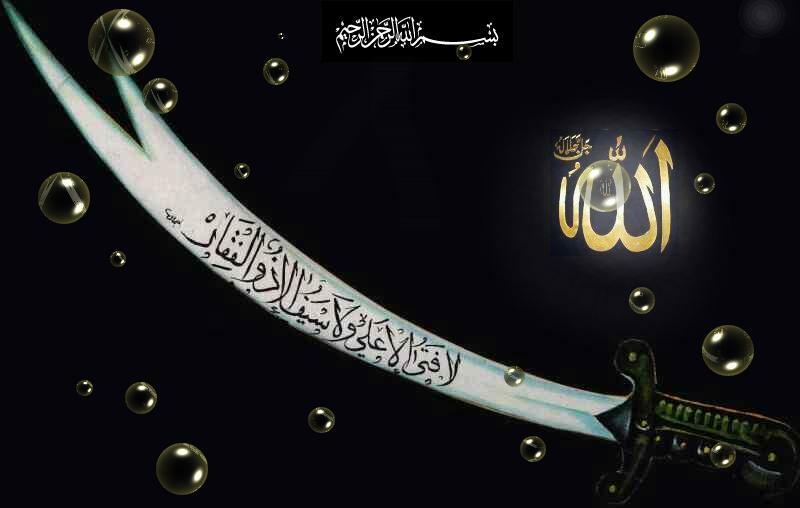 But in all the Islamic flags and all Islamic calligraphy, this lam alif symbolizes the sword of Prophet (sallallahu alaihi wasallam),the haqqa’iq. That if you want, not the sword that abuses people of this dunya that shaytaan uses, these are the analogy of realities; that these two points of lam alif, they must come and take the ignorance away. Means that what stopping you from that reality is your head. The head is, is the box, is the screen. You don’t do your computing in the screen, it must come to the CPU, must come where has infinite amount of storage, infinite amount of capacity. So then everything of realities is that: leave your head, leave your head at the door. Use your head for your accounting, for your maths, for your legal work, for your dunya. But the way of ma’rifa, the way of realities is, is la, negate. 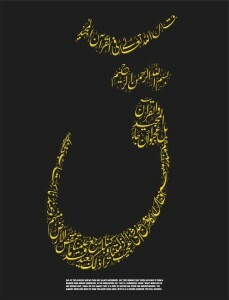 53:9 – Fakana qaba qawsayni aw adna. Then just focus on the la, and you see, what Prophet (sallallahu alaihi wasallam) went in qaab al-qawsayni aw adna: Surat al-Najm. Najm (Star), why? Because this is the reality of light. Stars are light, not planets. Allah ‘Azza wa Jal did not describe, “These are planet.” But najm means that this is surah of light, of stars. You want to be a star on a dark night, follow any of my Companions. Who must be the owner of all stars? 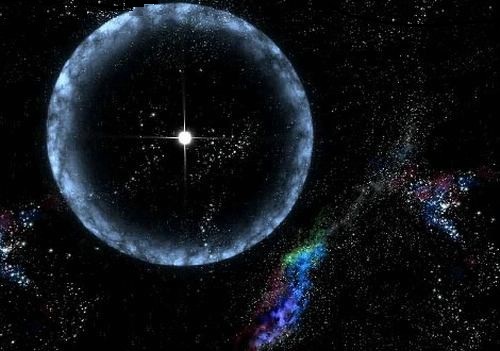 One of the names of Prophet (sallallahu alaihi wasallam): the Piercing Star. The Najmuth Thaqib is a piercing star. Means that reality, the owner of all the stars is Sayyidina Muhammad (sallallahu alaihi wasallam). Teaching us, that: you want to come into that reality, into the reality of lights, this is that reality. Now where do you see on this lam alif? You see the two bow lengths are nearer. When we say two bow lengths, what Prophet (sallallahu alaihi wasallam) was saying, “Two bow lengths.” Because ahlul ma’rifa, they would know, that lam alif, when you put the lam alif, two bow lengths are nearer, means that when these forces are coming an energy is being produced. They don’t have to touch, they don’t become one. Allah ‘Azza wa Jal la sharik! It’s enough that the reality of Prophet (sallallahu alaihi wasallam)’s mi’raj moves. 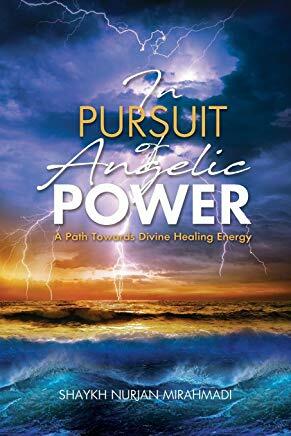 And Allah ‘Azza wa Jal’s ‘izzah and qudrah is there, and as soon as these energies come together, like taking two 500 Watt wires, you don’t even need to touch them, many of them from far away will begin to conduct the electrical contact. This is the reality of qaab al-qawsayni aw adna. This is the reality. From this reality, every drop, Maulana Shaykh describes, “There is a bird that comes down. It was a big, beautiful, green bird, they want to see how the vastness of Allah ‘Azza wa Jal’s creation. So there was a beautiful peacock that sits on a perch. 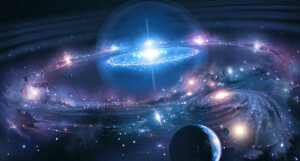 It goes down, it picks up a pearl, bites the pearl, and universes are brought into existence. 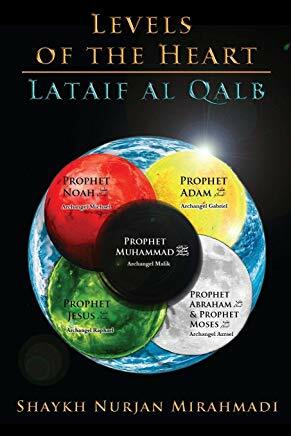 These are the pearls that are born from that reality.” When Allah ‘Azza wa Jal wants creation to come into existence, merely from the reality of qaab al-qawsayni aw adna, the qudr comes, and creation begins to manifest. Manifest one drop of that creation may be billions of galaxies, infinite in its capacity. لَا اِلّهَ اِلَّا اللهُ La ilaha illa-Llah, La ilaha illa-Llah. Only when you traverse the reality of Muhammadun RasoolAllah , at that time Prophet (sallallahu alaihi wasallam), within the heart of Prophet (sallallahu alaihi wasallam), begins to open. “In my heart, now make your zikr,” which is the real zikr of La ilaha illa-Llah لَا اِلّهَ اِلَّا اللهُ . 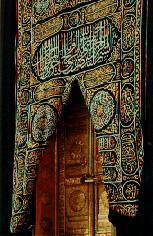 The first La ilaha illa-Llah لَا اِلّهَ اِلَّا اللهُ was on the outside looking in. Outside, you have to accept Oneness. If you’re accepting many gods, how you can come to Oneness? So that’s the outside. Bring everybody to Allah’s Ahadiyah: “Qul hu wa-Llahu Ahad,” bring them to Oneness. When they came to Oneness, and they’re accepting La ilaha illa-Llah لَا اِلّهَ اِلَّا اللهُ , la ilaha illa-Llah, la ilaha illa–Llah, Allah ‘Azza wa Jal says, “Now I’m going to bring you and give you the gift of maqam al-Mahmood. 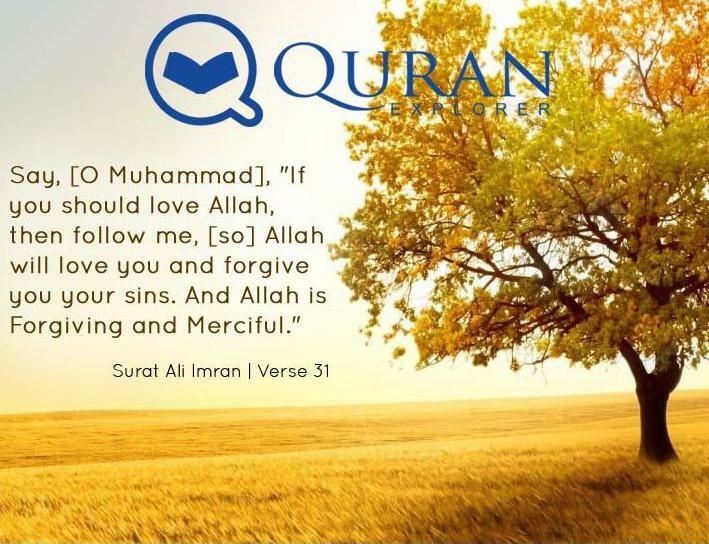 Now say Muhammadun RasoolAllah ” because Allah loves Prophet (sallallahu alaihi wasallam). When Allah loves you, He gives you the reality of Sayyidina Muhammad (sallallahu alaihi wasallam). Come to the love of Sayyidina Muhammad (sallallahu alaihi wasallam). So means the ashiqeen, when they have that love of Prophet (sallallahu alaihi wasallam), then the ma’rifa of Allah ‘Azza wa Jal is the ma’rifa of Sayyidina Muhammad (sallallahu alaihi wasallam). 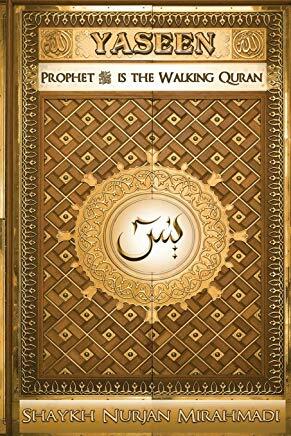 Means that, you want to know Allah, then you have to come to know Prophet (sallallahu alaihi wasallam). So when you come to the baab, and to the door, and they begin to teach you: take the path of la, that negate everything, negate yourself, constant life of negation. Every time you’re raised, negate, every time you’re elevated, negate, anything that you spiritually feel was given to you, negate. Constantly be nothing. So the way of negation is, “Ya Rabbi, we’re always thirsty, we’re always hungry for your realities. I’m nothing, I’m nothing, I’m nothing, let me to be annihilated. La ilaha illa anta subhanaka, inni kuntu minaz Zhaalimeen,” that, “there’s nothing but You and I’m an oppressor to myself, there’s nothing but you and I’m oppressor; I’m an oppressor physically, I’m an oppressor spiritually because I’m not negating myself enough to reach deeper into these realities.” At every moment they’re asking for us to empty the cup, empty the cup, live a life completely of emptying your cup so that Allah ‘Azza wa Jal always fills that fountain. And how do you empty your cup? Is by giving what was soulfully given to you. Keep negating, keep negating, keep being of service, so that Allah ‘Azza wa Jal keep pouring, keep pouring, keep pouring. Then they begin to teach, we ask, “Ya Rabbi, teach us from the realities of companions of The Prophet (sallallahu alaihi wasallam) and Family Ahlul-Bayt an-Nabi (sallallahu alaihi wasallam),” and Muharram being from twelve months and twelve holy members of Prophet (sallallahu alaihi wasallam)’s family; that Imam Ali (alaihis salaam) being the first of them, Imam Mahdi (alaihis salaam) being the last of them, the twelfth of them. 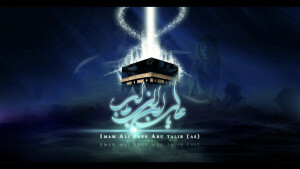 Means that the reality of Imam Ali (alaihis salaam) towards only the understanding of that reality. That again coming to that, that everything from these Ahlul-bayt: Imam Ali, Sayyidina Muhammad (sallallahu alaihi wasallam), Imam Ali (alaihis salaam), Sayyidutina Fatima Zahrah (alaihis salaam), Sayyidina Imam Hassan (alaihis salaam) al-Mujtabah, Imam Husayn (alaihis salaam), there must be those nineteen letters, are the reality of the nineteen letters of Bismillahir rahmanir raheem. 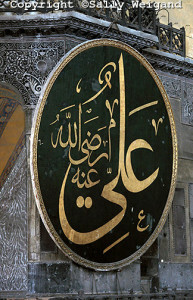 Bismillahir rahmanir raheem, its banner is Ya Hamid wa Bi haqq Muhammad (sallallahu alaihi wasallam). Means it is by the hamd of Sayyidina Muhammad (sallallahu alaihi wasallam), that, it is the speaking of Bismillahir rahmanir raheem. We said that this is the tongue of Allah ‘Azza wa Jal. As soon as Prophet (sallallahu alaihi wasallam) says, “Bismillahir rahmanir raheem,” is moving, creation is moving, creations are manifesting. Everything is in that Bismillahir rahmanir raheem. Its crown is Muhammad. Who’s the door to this reality? Who are the people of the door, the baab? 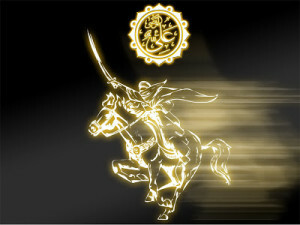 Imam Ali (alaihis salaam) saying, “You want to come, I’m going to teach you the sirr. I’m going to teach you the secret, the seen is the sirr, Ya Seen (sallallahu alaihi wasallam) is the heart of Holy Qur’an.” You want to understand the sirr? Which sirr? The sirr of Nabi Muhammad (sallallahu alaihi wasallam). It’s in Allah, Most High. 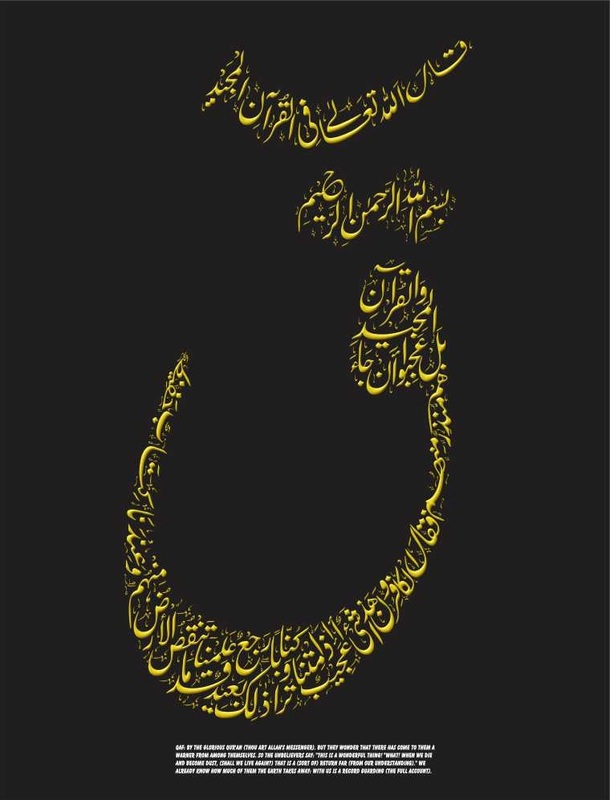 Ya Rabbi, bi haqqi ya Imam Ali. Teaching us that the custodians of that reality, they are the ones who come and say, “Look, let your head to go. The head has to perish, you have to open the reality of the heart.” So when the reality of the heart is coming and you’re accepting the love of Asaahab an-Nabi (sallallahu alaihi wasallam), the love of Alhul-Bayt an-Nabi (sallallahu alaihi wasallam), beyond that, now come to the door of their realities to understand what other Allah ‘Azza wa Jal is dressing us by. By loving them, they are reflecting that love back, they are reflecting these haqqa’iq back. So then in the name of Imam Ali (alaihis salaam), Allah ‘Azza wa Jal has given a ya, of yaqeen, that, “I am the custodian of certainties,” that, you want to enter to this ba, that’s why I say, Oh how powerful that ba is we can hardly imagine! All of Holy Qur’an is in thirty Juz. All thirty Juz is in seven verses of Fatiha. All- like now we’re getting to the power like a laser- all of Suratul Fatiha in nineteen letters of Bismillahir rahmanir raheem, in these names. Their personalities and their souls, they hold the secret, sahib ul-Qur’an. “Come, come to the door of our yaqeen, ilm ul-yaqeen, ‘ayn al-yaqeen, haqq yaqeen,” that, “we are the people of certainty to teach you from ilm ul-yaqeen, from Allah’s ancient Knowledges; ‘ayn al-yaqeen, that we teach you how to negate yourself and bring the vision of your soul,” because they are the ones who hold the sword for the head. With ilm-ul yaqeen and the mixture of ‘ayn al-yaqeen, you be granted haqq yaqeen. 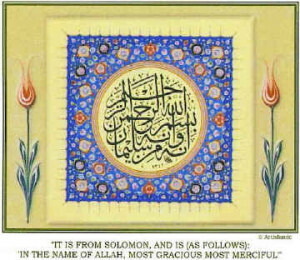 Ilm, (‘ayn), is the sahib of ‘ayn. ‘Ayn, ‘ayn also, ‘ayn is also vision. You want the vision of certainty, you want the knowledges of certainty, all of that will be the haqq of certainty. Means, “I’m going to take you now into that city, I’m going to dress you from these realities, then Allah ‘Azza wa Jal, what Allah ‘Azza wa Jal has dressed [are you showing on here?] What Allah ‘Azza wa Jal’s yaqeen? Back to: it has the secret of lam, where Suratul Maryam I believe describes, that, “Whom we’ve given the tongue of truth has been given a tremendous lofty gift.” Lisaan as-siddiq. That, this tongue of reality is that Imam Ali (alaihis salaam) is inheriting, is Allah ‘Azza wa Jal’s greatest gift. What Allah ‘Azza wa Jal wants to give us, money from dunya to be lost, paradises in heaven to be distracted? Says, “I’m making you the custodian of My Divinely realities. My Divinely knowledges that I’m giving to Sayyidina Muhammad (sallallahu alaihi wasallam) ‘a’tayna kal Kauthar’. You’re going to be from the masters of that Kauthar, distributing the realities of that Kauthar.” ‘Cause this, the Companions hold tremendous reality: Umar, Uthman, Umar wa Ali, they are the custodians of that ‘ayn. But for tonight, the realities of Imam Husayn (alaihis salaam) towards only the drop of the understanding of Imam Ali (alaihis salaam). But dressed by that lisaan, dressed by that reality that, “I am the custodian of that tongue, lisaan as-siddiq. I’m going to take you to Allah ‘Azza wa Jal’s Divinely ‘ayn. 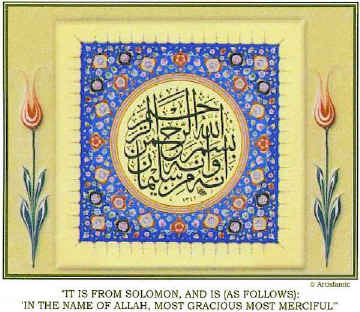 Means al-‘Aleem. ‘Aleem. ‘Alee-meem. [Laughter] ‘Aleem. What more can you say? “I’m going to dress you from sifat al-‘Aleem; it has ali-meem. 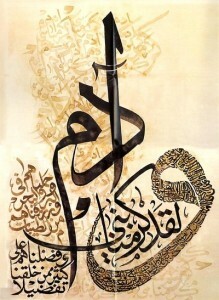 Alif, lam, ya, meem: Allah ‘Azza wa Jal’s ancient Knowledges, that everything is coming from sifat al-‘Aleem. ‘Khalaq al-insaana min alaq, khalaq al-insaana min alaq,’ ‘ayn, lam, qaaf; that even all knowledges are coming from that ‘ayn, manifesting on lisaan al-haqq and becoming qaaf. 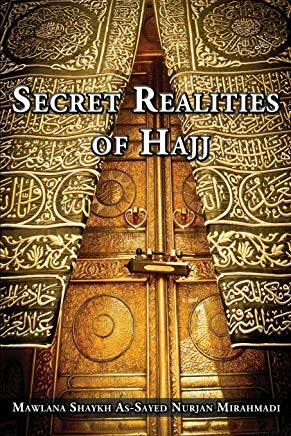 What Allah ‘Azza wa Jal says for qaaf, “Qaaf, wal Qur’an al-Majeed.” Means now this is the fountainhead of all realities. Allah ‘Azza wa Jal say, “With that knowledge, khalaq al-insaan.” Means the sifat al-khalq, the secret of all creation, that every creation is coming from a knowledge, and coming from which sifat? 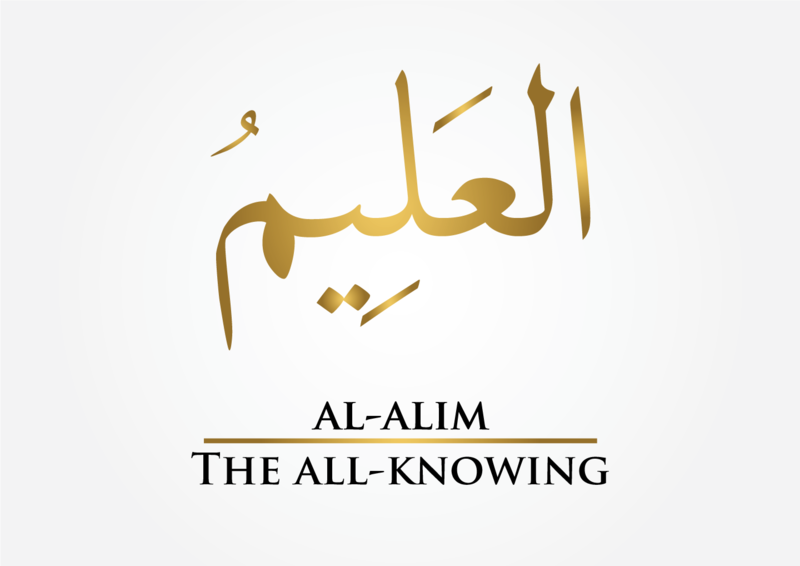 Al-‘Aleem, that it has the name of Imam Ali (alaihis salaam) and the meem to tell you what’s the source of that knowledge. ‘Cause the meem has the turban, cloth that comes down. The turban is a meem, you wrap it and bring it down. So Prophet (sallallahu alaihi wasallam) said, “Carry the meem, carry your turban upon your head. It is my meem.” When they see you with the turban they see you as Muhammadiyun [Audience: Subhanallah]. When Allah ‘Azza wa Jal says, “Hold tight to the rope,” this is the rope of Allah ‘Azza wa Jal. Means that rope, when it comes down, it is the qalam that writes all these realities. ‘Cause it’s coming from Allah ‘Azza wa Jal’s ancient Fountains, where Allah ‘Azza wa Jal saying, “I gave you ‘a’tayna kal Kauthar’. I gave you these oceans and I gave you all the trees and if all these knowledges and the trees were writing on all the ink, My Words would never finish. Because if every tree was a pen and every ocean was ink, My Words would never finish,” means what Allah ‘Azza wa Jal gave, gave the source of all realities and all knowledges. And all the tariqas are teaching La ilaha illallah لَا اِلّهَ اِلَّا اللهُ , La ilaha illallah. 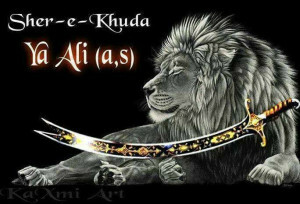 Then Imam, in the sahib of the safe, the sahib of that sword, Imam Ali (alaihis salaam) comes and says, “Then take that head off, take your mind off of your realities and reach with your heart. I’m going to dress you from yaqeen, I’m going to dress you from the tongue of truth and I’m going to dress you from Allah’s ancient Knowledges of al-‘Aleem.” And every reality and every blessing is coming from that. 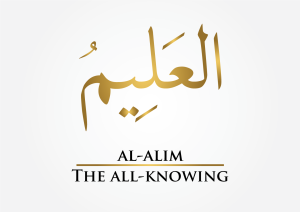 Means, “Khalaq al-insaana min alaq,” means everything in creation coming from sifat al-‘Aleem. Anything that you love, will love you back. We cannot compete in amal. We cannot pray enough to be taught that. You cannot fast enough to be given that. You cannot make hajj enough to be given that. This is only through Muhammadan love, that if Allah ‘Azza wa Jal pleased, that, “I like the way you act, I like the way you behave. You are loving, kind person. I will bring you and I will teach you ‘ittaqullaha wa ‘aleemukumullah’.” Allah ‘Azza wa Jal says, “Have a consciousness and feel Me and fear Me. Have a love for Me and respect Me. I bring you to all these realities.” As soon as you love them, they love you more. As soon as you show respect for them (alaihis salaam), they show respect for you. What they’re going to give us what we need, is knowledge. Ya Rabbi zidni ‘ilma laduni wa hikmati bis-saaliheen, Ya Rabbi, grant me from your Divinely knowledges, and hikmah to use that knowledge; not to use that knowledge for hurting people, but a wisdom in how to apply that knowledges for ourselves. Subhana rabbika rabbil izzati ‘amma yasifoon, wa salaamun alal mursaleen, wal hamdulillahi rabbil ‘aalameen.